What is the shelf life of the jar meal? There is not a simple answer, but it depends on several factors. But let's break it down to some info we need to consider. Most companies say that their freeze dried foods last 25-30 years unopened, but once opened, you have about 1 year to use the product in the can. This will vary according to the exact product. 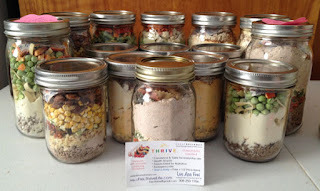 You will need to know the approximate shelf life of the products you put into the jar. With this in mind, you would need to consider the shelf life of each product in the jar, AND YOU NEED TO SEAL THE JAR using Oxgen Absorbers or Food Saver with a jar attachment for vacuum sealing! I also prefer wide mouth jars, they fill and seal easier for me. If the unopened can shelf life of sausage is 25 years, but you also have Pasta in the jar which only has a shelf life of 8 years, then your jar meal technically has a shelf life of 8 years. But you also need to consider that a jar is clear and lets in light. Light can also reduce the shelf life of your food. I store my jar meals in a closet or pantry cupboard so that reduces the light but I date when I made it and when I should use it by. So far I have not had any more than 2 years, because we ate them sooner than that. Rule of thumb... Whatever the lowest opened shelf life is for all of the products in your jar, so label it with the date you should use it by. Can I store them in Zip Lock Freezer bags? Maybe.. from what I have experienced, items in one do go soft quick. I olny use them for things I will eat within a week or two max. For longer term I use Food Saver bags and seal them. It's a great option for temporary storage...like when traveling, camping, or backpacking. SHORT ANSWER: Everyone seems to have their own opinion. I have read a lot about this online, in cookbooks and from others that make and use jar meals. I have found that not everyone has had the same opinions. Be smart, make sure your jars are completely dry before you fill them, use quality fresh products, store in a dark cabinet or pantry, seal them if you can for added protection, and use within a reasonable amount of time. Just eat them! They are delicious!